Taupo teen Briar Burnett-Grant capped off a brilliant weekend at the Larsen Sawmilling North Island Jumping and Show Hunter Championships in Gisborne with a win in the Equissage Premier League and as a member of the victorious New Zealand team in the trans-Tasman young rider clash. Twelve started the premier league with seven combinations with four faults and less coming back for the second round. Sitting on zero faults were Drew Carson (Putaruru) aboard Winston V Driene, Briar aboard Fiber Fresh Veroana, Tess Williams (Hastings) on Sinatra II and her flat mate Melody Matheson (Hastings) aboard Graffiti MH. Clears in the second came from Emily Hayward (Te Awamutu) aboard Yandoo Lady Gold, Drew, Briar and Melody but it all came down to time. Briar and Fiber Fresh Veroana are always super-fast and they wasted no time at all in zipping around the Heather McDonald-designed course in 51.21 seconds. It wasn’t without a couple of heart-stopping moments but in the end everything stayed up. Briar admits Veroana, who last year won the Olympic Cup as showjumper of the year, is a handful and erratic but he does listen to his pint-sized rider. It was a big course today, something welcomed by top riders. While the Kiwis rode off with the spoils in the Easts Outdoor Work and Leisure New Zealand v Australia Young Rider Test both chefs d equipe said both nations were the winners in an event like this. New Zealand – represented by Briar Burnett-Grant (Taupo), Emily Hayward (Te Awamutu), Oliver Croucher (Cambridge) and Steffi Whittaker (Canterbury) finished with eight points to the visitors – represented by Lucie Aldridge, Lucy Evans, Clemancy Hughs and Cameron Moffatt –were on four. The competition, which ran over three days, saw plenty of determination from the young riders. Australian chef Todd Hinde said he was very proud of his riders, all of whom were on debut for Australia and very inexperienced at competing aboard borrowed horses. He paid credit to the New Zealand team who had been great both on and off the field of play. New Zealand chef John Cottle reiterated his words. “Our team were very consistent and are a very talented bunch of riders. I have thoroughly enjoyed working with them. Our Australian visitors hung in there and fought hard for a good competition,” said John. Emma Noble-Campbell (Tuakau) and Whakapirau Cherry Ripe were the only double clears in the 11-strong East Coast Wools and Country TV North Island Pony Grand Prix class. Six came back for the second round where runner-up Tyla Hackett (Waiuku) and The Dreamer also went clear but were carrying four faults from the previous round. It was just Emma’s sixth grand prix start on the gelding she has carefully produced for the past six-and-a-half years. It was a special win too as they had come to the Gisborne Champs for the first time because it is where her ancestors had farmed for generations. The three day championships were held in typically hot East Coast weather on grounds that riders said was near perfect. Results – Jumping, Easts Outdoor Work and Leisure New Zealand v Australia Young Rider Test final result: New Zealand – Emily Hayward (Te Awamutu), Briar Burnett-Grant (Taupo), Steffi Whittaker (Canterbury) and Oliver Croucher (Cambridge) 1; Australia – Cameron Moffatt, Clemancy Hughs, Lucie Aldridge and Lucy Evans 2. Larsen Sawmilling and Equissage North Island Premier League: Briar Burnett-Grant (Taupo) Fiber Fresh Veroana 1, Melody Matheson (Hastings) Graffiti MH 2, Drew Carson (Putaruru) Winston V Driene 3, Tess Williams (Hastings) Sinatra II 4, Emily Hayward (Te Awamutu) Yandoo Lady Gold 5, Tom Tarver (Kawerau) Popeye 6. Bayleys Real Estate Gisborne FEI CSI1* open horse 1.4m: Melody Matheson (Havelock North) Graffiti MH 1, Briar Burnett-Grant (Taupo) Fiber Fresh Veroana 2, Brooke Edgecombe (Waipukurau) LT Holst Andrea 3, Tess Williams (Havelock North) Sinatra II 4, Emily Hayward (Te Awamutu) AP Ninja 5, Todd Magner (Cambridge) Awatuna Jonesy 6. East Coast Wools and Country TV North Island Pony Grand Prix: Emma Noble-Campbell (Tuakau) Whakapirau Cherry Ripe 1, Tyla Hackett (Waiuku) The Dreamer 2, Katie Bridgeman (Auckland) Tallyho Scoundrel 3, Rylee Sheehan (Te Aroha) Tony the Pony 4, Lucy Buchanan (Hastings) Redcliffs Colour Me Quick 5, Maddison Greatorex (Waipu) Spotified 6. McCannics and Dunstan Horsefeeds and EquiFibre North Island Junior Rider with Equitation: Ally Carson (Putaruru) Whiorau Ritchie 1, Tyla Hackett (Waiuku) George Jetson 2, Sarah West (Matamata) LC Talent 3, Emma Watson (Morrinsville) Cadenza 4, Leeshelle Small (Auckland) AMS Mr Muscles 5, Olivia Dalton (Karaka) Appleton 6. Farmlands and Dunstan Horsefeeds and EquiFibre North Island Pro Amateur Rider: Kirsten Worker (Clevedon) Melanies Choice 1, Jaime Campbell (Cambridge) Lanice van de Heffinck 2, Kim Best (Hastings) LT Holst Teacher’s Pet 3, Samantha Peters (Cambridge) Dodge NZPH 4, Ashley Hart (Hastings) Kiwi Showtime 5, Bryony Smith (Muriwai) Ngahiwi Indigo 6. Eastland Veterinary Services and Matthews Hanoverians North Island Seven-Year-Old: Luke Dee (Otaki) Numero Uno Xtreme 1, Samantha Peters (Cambridge) Caesar NZPH 2, Samantha Peters (Cambridge) Cadillac NZPH 3, Oliver Edgecombe (Waipukurau) Carnival NZPH 4, Dirk Waldin (Havelock North) Good Time 5, Lucy Olphert (Tauranga) Double J Beyonce 6. Ngahiwi Sport Horses and Mitavite Speedi-Beet North Island Six-Year-Old: Melody Matheson (Hastings) Enya MH 1, Kim Best (Hastings) LT Holst Teacher’s Pet 2, Paula Mussen (Auckland) Déjà vu NZPH 3, Kirsten Worker (Clevedon) Clearcut Xtreme 4, Ashley Hart (Hastings) Kiwi Centrokee 5, Alex Loiselle (Ocean Beach) Davinci NZPH 6. 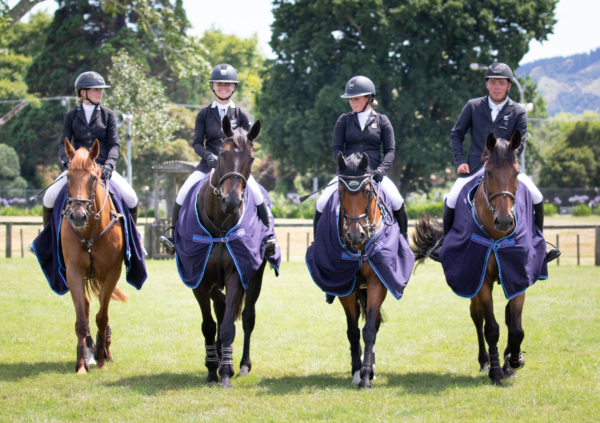 Farmers Air and FMG North Island Young Rider: Todd Magner (Cambridge) Awatuna Jonesy 1, Emily Hayward (Te Awamutu) Yandoo Lady Gold 2, Oliver Croucher (Cambridge) Waitangi Surf 3, Ally Carson (Putaruru) Letano 4, Olivia Dalton (Karaka) Cil Dara Bonaparte 5, Emelia Forsyth (Clevedon) Henton Faberge 6. Geoff Candy Marika Station North Island Open Horse Classic: Luke Dee (Otaki) Cheyenne 1, Alex Loiselle (Ocean Beach) Bandito NZPH 2, Sarah West (Matamata) Oaks Centurian 3, Briar Burnett-Grant (Taupo) On the Point Sandy 4, Melody Matheson (Hastings) Illusion SSH 5, Oliver Edgecombe (Waipukurau) Carnival NZPH 6. McNeil Farming and East Coast Performance Horses North Island Five-Year-Old: Fraser Tombleson (Gisborne) Eye See Ruby 1, Jaime Campbell (Cambridge) Casanova Xtreme 2, Jeremy Whale (Cambridge) Fleur De Lacour 3, Luke Dee (Otaki) Shic Xtreme 4, Alex Loiselle (Ocean Beach) Encore NZPH 5, Ashley Hart (Hastings) Kiwi Sapphire 6. PGG Wrightson and Hinterland North Island Amateur Rider: Paxton Condor (Hamilton) La Fonteyn 1, Amy Schischka (Auckland) Hollywood Wannabe 2, Sarah Aitken (Gisborne) Ngahiwi Prince 3, Charlotte Wing (Hastings) Mistress 4, Larina Dolman (Gisborne) Kiwi Lansing 5, Shelley Bridgeman (Auckland) Oaks Vendetta 6. Main-Events University Series: Brianna Donion (Rotorua) Weiti Drama 1, Megan Schischka (Hibiscus Coast) Hollywood Wannabe 2, Lucy Win-Hewetson (Gisborne) Karakia 3, Emelia Forsyth (Auckland) Illustrious 4. Emerre & Hathaway North Island Mini Prix Pony 1.15m: Ally Stevenson (Tomoana) Moose 1, Emma Watson (Morrinsville) Galaxy Bonfire 2, Ally Stevenson (Tomoana) Watch Me Cruise 3, Grace Stevenson (Tomoana) Tallyho Madonna 4, Annie Moffett (Napier) Piripi 5, Grace Stevenson (Tomoana) Tallyho Reuben James 6. Stihl Shop Clares North Island Open Horse Classic 1.25m: Bryony Smith (Muriwai) Ngahiwi Indigo 1, Ella Davidson (Tauranga) Glenara Ladyhawke 2, Edward Bullock (Waiuku) Weiti Danneverke 3, Lucia Voss (Kawerau) Grand Coeur 36 4, Tess Williams (Hastings) Cadbury 5, Jono Smith (Kinloch) Millhouse 6. Leaderbrand Produce North Island Speed Pony 1.15-1.25m: Tyla Hackett (Waiuku) The Dreamer 1, Emma Nobel-Campbell (Tuakau) Whakapirau Cherry Ripe 2, Katie Bridgeman (Auckland) Tallyho Scoundrel 3, Amelia Paull (Gisborne) Envious Edition 4, Dylan Bibby (Onga Onga) Daisy Patch 5, Victoria Mitchell (Kumeu) Showtym Mochachino 6. Leaderbrand Produce North Island Speed Horse 1.2m-1.3m: Mikayla Herbert (Rotorua) Snow Storm 1, Bryony Smith (Muriwai) Ngahiwi Warrior 2, Megan Schischka (Hibiscus Coast) Hollywood Wannabe 3, Kirsten Worker (Clevedon) Melanies Choice 4, Lucy Olphert (Tauranga) Eve Saint Laurent 5, Donna Atkinson (Te Puke) Dob Em In 6. Bernina Sewing and Crafts FEI Children’s International Classic 1.1m (first day): Jakob Pascoe (Amberley) Waitangi Wifi 1, Rylee Sheehan (Te Aroha) Tony the Pony 2, Jessica McCann (Gisborne) Galaxy Knight In 3. Day two: Rylee Sheehan (Te Aroha) Tony the Pony 1. Show Hunter, AF Thompson Contracting North Island pony rider equitation: Victoria Mitchell (Kumeu) Nickelodeon 1, Amelia Newsom (Tauranga) D’urville 2, Ellie Deane (Hamilton) Galaxy Magician 3, Ella von Dadelszen (Waipukurau) Star Waka 4, Janey Pease (Piopio) My Cats Pyjamas 5, Isobel Jayne Bevitt (Gisborne) Kaycee Montego 6. BDO Gisborne North Island Category C Champion HOYQ 90cm: Ellie Deane (Hamilton) Galaxy Magician 1, Victoria Mitchell (Kumeu) Nickelodeon 2, Amelia Newsom (Tauranga) D’urville 3, Hannah von Dadelszen (Waipukurau) Star Waka 4, Lily Beaufoy (Gisborne) Iamwhatiam 5, Emily Watson (Cambridge) Glenardon Summer Breeze 6. Rebecca Williams Photographer North Island Category B: Annie Moffett (Napier) Oki Pop 1, Hannah McConnell (Tauranga) Billy Blunt 2, Kate Shaw (Takapau) Benmore Pizzazz 3, Katelyn Peterson (Whakatane) My Sweet Nevaeh 4, Ella von Dadelszen (Waipukurau) Matai SB 5, Isobel Jayne Bevitt (Gisborne) Kaycee Montego 6. Aniwell HOYQ pony highpoints 80cm Cat C: Amelia Newsom (Tauranga) D’urville 1, Emily Watson (Cambridge) Glenardon Summer Breeze 2, Victoria Mitchell (Kumeu) Nickelodeon 3, Hannah von Dadelszen (Waipukurau) Star Waka 4, Lily Beaufoy (Gisborne) Iamwhatiam 5, Ellie Deane (Hamilton) Galaxy Magician 6. Burger King HOYQ pony highpoints 80cm Cat B: Hannah McConnell (Tauranga) Billy Blunt 1, Isobel Jayne Bevitt (Gisborne) Kaycee Montego 2, Lily Beaufoy (Gisborne) Pine Hollow Alpha Gold 3, Katelyn Peterson (Whakatane) My Sweet Nevaeh 4, Ella Rouse (Gisborne) Ruby Tunes 5, Annie Moffett (Napier) Oki Pop 6. Cartown HOYQ pony highpoints 70cm Cat A: Emma Bates (Rotorua) My Gemma Bear 1, Isobel Jayne Bevitt (Gisborne) Buffalo Man 2, Ava Stone (Gisborne) Hololio Sparkling Rose 3, Moly MacLachlan (Te Kuiti) Greenlee Calypso 4, Karma Matenga (Gisborne) Snoopy 5. MJK Sport Horses North Island junior championship highpoints: Lauren Mitchell (Kumeu) Sonny Bill 1, Kate Herdson (Auckland) Seamless 2, Amelia Newsom (Tauranga) Tribute OL 3, Tristan Thomas (Rotorua) Airborne MVNZ 4, Lauren Mitchell (Kumeu) Craighaven Black Heart 5, Janey Pease (Piopio) Roxy 6. Natalie Knight Osteopath North Island amateur champion high points: Merran Hain (Gisborne) Untouchable 1, Ashleigh Forde (Hastings) My Gummi Bear 2, Lisa Walker (Gisborne) Miss Serendipity 3, Eugene Black (Whakatane) Valdarno Joel 4, Caroline Coop (Gisborne) Budgie 5, June Berrington (Whakatane) Kiwi Iron Mark 6. Ben Akuhata-Brown Farrier North Island combined junior and adult rider: Tristan Thomas (Rotorua) Airborne MVNZ 1, Amelia Newsom (Tauranga) Tribute OL 2, Ashleigh Forde (Hastings) My Gummi Bear 3. NRM HOYQ open horse highpoints: Merran Hain (Gisborne) Untouchable 1, Lucy Olphert (Tauranga) Atlanta WWPH 2, June Berrington (Whakatane) Kiwi Iron Mark 3, Holly Baines (King Country) Halo 4, Holly Baines (King Country) Hero 5, Eugene Black (Whakatane) Valdarno Joel 6. EJ Gordon Livestock North Island champion open horse: Merran Hain (Gisborne) Untouchable 1, Tristan Thomas (Rotorua) Airborne MVNZ 2, Ashleigh Forde (Hastings) My Gummi Bear 3, June Berrington (Whakatane) Kiwi Iron Mark 4, Lidy Loffler (Wairoa) Graceful 5, Eugene Black (Whakatane) Valdarno Joel 6. Cartown HOYQ category A pony high points: Emma Bates (Rotorua) My Gemma Bear 1, Isobel Jayne Bevitt (Gisborne) Buffalo Man 2, Karma Matenga (Gisborne) Miss Candy Floss 3, Molly MacLachlan (Te Kuiti) Greenlee Calypso 4, Ava Stone (Gisborne) Hololio Sparkling Rose 5, Karma Matenga (Gisborne) Snoopy 6. Burger King HOYQ pony high points 80cm Cat B: Hannah McConnell (Tauranga) Billy Blunt 1, Isobel Jayne Bevitt (Gisborne) Kaycee Montego 2, Lily Beaufoy (Gisborne) Pine Hollow Alpha Gold 3, Annie Moffett (Napier) Oko Pop 4, Tessa Harre (Piopio) Capesthorne Park Limerick 5, Kate Shaw (Takapau) Benmore Pizzazz 6. Aniwell HOYQ open high points Cat C: Emily Watson (Cambridge) Glenardon Summer Breeze 1, Hannah von Dadelszen (Waipukurau) Star Waka 2, Katelyn Peterson (Whakatane) Kendra 3, Victoria Mitchell (Kumeu) Nickelodeon 4. Combined Gyro Plastics Junior and The Ultimate Egg Company Amateur: Lauren Mitchell (Kumeu) Craighaven Black Heart 1, Lauren Mitchell (Kumeu) Sonny Bill 2, Ashleigh Forde (Hastings) My Gummi Bear 3, Merran Hain (Gisborne) Untouchable 4, June Berrington (Whakatane) Kiwi Iron Mark 5, Lisa Walker (Gisborne) Miss Serendipity 6. Combined ESNZ junior/adult rider equitation: Tristan Thomas (Rotorua) Airborne MVNZ 1, Lauren Mitchell (Kumeu) Sonny Bill 2, Ashleigh Forde (Hastings) My Gummi Bear 3. NRM HOYQ open horse high points: Lauren Mitchell (Kumeu) Craighaven Black Heart 1, Ashleigh Forde (Hastings) My Gummi Bear 2, Tristan Thomas (Rotorua) Airborne MVNZ 3, Luke Dee (Otaki) Untouchable 4, June Berrington (Whakatane) Kiwi Iron Mark 5. Holly Baines (King Country) Halo 6.